In my efforts to research the Cromwell Shoe Store, none of my normal sources have panned out. Those sources include E. C. (Mike) Aft's various books, the Gail Borden Library and the Courier Newspaper. Quite frankly, that has never happened before. One of Elgin's charms is that it's history has been so meticulously recorded that uncovering facts about any of its treasures is relatively easy. The name Cromwells Shoe Store does not ring a bell. The post card, of course, is from a much earlier time. The storefront (in the picture) looks like a store that was called Three Sisters, which was a ladies clothing store on Grove, across from my dad's restaurant. If you refer to "Greetings from Elgin", (my father's) restaurant was two doors north of the Elgin National Bank on Grove, next to a dress shop called Barnetts (with the white front). In front of the bank was a little popcorn cart on wheels. A little old man sold fresh popcorn, peanuts and caramel corn. 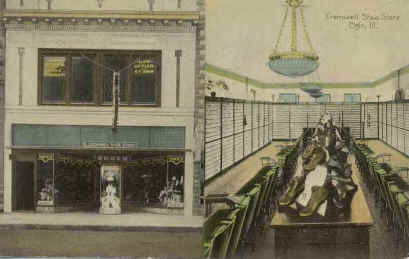 A picture of that popcorn cart is in the Chicago Historical Society. 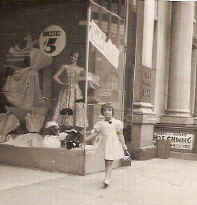 Speaking of shoe stores, there was one across from (my father's) restaurant, next to the Three Sisters store. While I can't remember the name, it may have been Cromwells. That is not the first time that I have had people comment about the popcorn vendor. One more example of how wonderful it must have been to grow up in Elgin. This information comes from Mary Manolis Robertson , who grew up above her father's restaurant on Grove Street in Downtown Elgin.